What a way to open the season—with Corey Dargel's Removable Parts, a striking piece of theater and music about a most unusual topic: voluntary amputation. 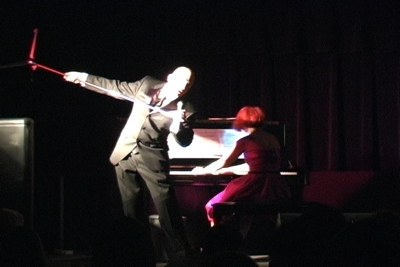 Corey Dargel (as the singer) and Kathleen Supové (as the pianist) took the packed house of Club Sudakoff on a funny and touching wild ride using song, dance, and electronic processing, as they explored characters who choose to alter their bodies in ways most people would consider extreme. And although the theme of the piece was startling, what made the evening memorable was the variety and quality of the music and the incredible skill of the performers. 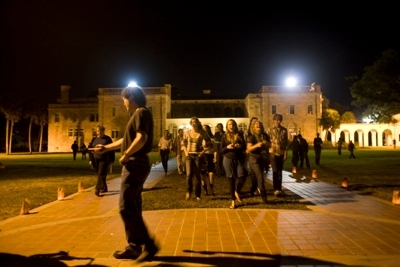 Playspace was an outgrowth of a class taught by NMNC Director Stephen Miles entitled Experimental Music in Theory and Practice. 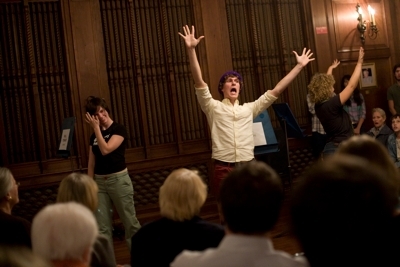 Miles and the New College students explored the concept of "play" in the context of performance and reception. 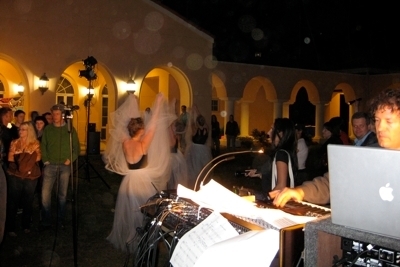 The concert itself was comprised of four pieces: Following, (which Miles originally wrote for the NMNC concert "Social Studies" in 2003) where three students conduct the audience members through a series of vocal gestures; Sonic Meditation X and The Slow Song, both by Pauline Oliveros; and Linkage, written by Miles for this concert. 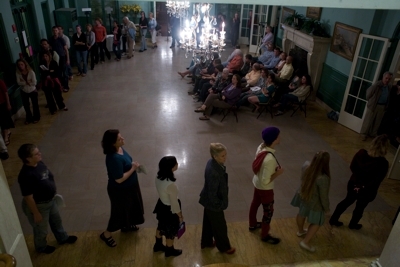 The audience was invited to participate in The Slow Song and Linkage as well as Following, and the entire ground floor of College Hall was used over the course of the evening. 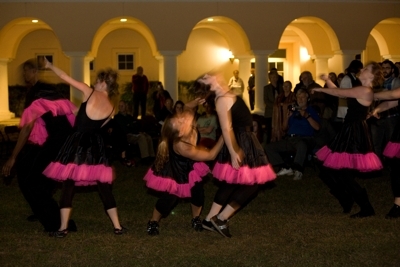 At the end of Linkage, where individuals form pairs and then larger groups by consolidating simple pitches into larger and larger melodic units, everyone streamed outside and continued singing as they strolled down to the Bayfront. Cellist Scott Kluksdahl and pianist Noreen Cassidy-Polera offered a centuries-skipping program that juxtaposed late-twentieth- and early-twenty-first-century works with a Beethoven sonata written in 1808. The program opened with Lowell Liebermann's Sonata No.2 for Cello and Piano, Op.61 (1998), a meditation on a fragment from Liebermann's opera The Picture of Dorian Gray. 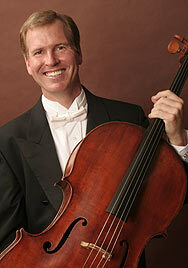 Then followed Richard Wernick's Duo for Cello and Piano (2002), a three-movement piece commissioned by Kluksdahl. The final movement utilizes a motif that contains a musical code for the date 09/11/01, in remembrance of which the movement is dedicated. Then came Beethoven's Sonata No. 3 for Piano and Cello, Op. 69, and after the two recent pieces, the Beethoven sounded remarkably modern. 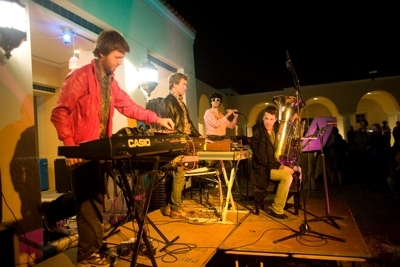 As part of a weekend collaboration with the Sarasota Orchestra NMNC presented an ambitious outdoor concert on three stages surrounding the audience (and the following evening the Orchestra played works by living composers including a new piece by New College and NMNC alum Silas Durocher). 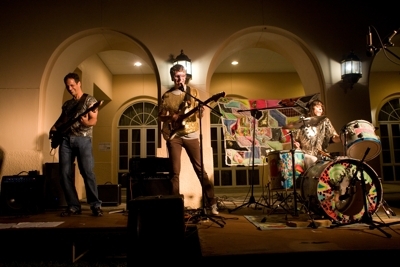 Principal Tubist Jay Hunsberger and Principal Double Bassist John Miller joined three New College student rock bands—The Done For, Tyger Beat, and Skeleton Warrior—for an evening of musical mixing under the stars, in the PepsiCo Arcade behind the Sainer Auditorium. 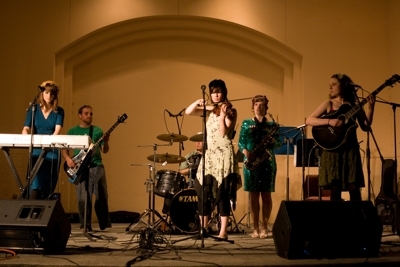 Both Miller and Hunsberger joined The Done For on Stage 1 for some of their songs, then Hunsberger and violinist Sara Stovall performed a duet while each walked along separate paths to the other end of the arcade. 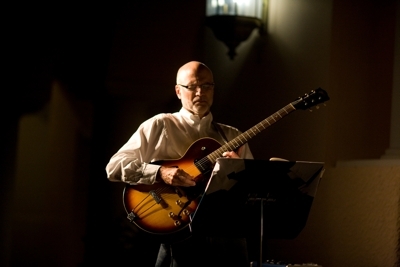 After this, Hunsberger performed Francis Schwartz's solo piece The Grey Road (commissioned by Hunsberger in 2007) on Stage 3. Next up was Tyger Beat on Stage 2, and Miller joined them on bass for two songs. After that, Skeleton Warrior invited Hunsberger to join them on Stage 3. For the explosive finale, the entire company (on all three stages) was joined by NMNC Director Stephen Miles on guitar, Technical Producer R. L. Silver on synthesizer, and Fuzión Dance Artists (choreographed by Leymis Bolaños Wilmott) dancing through the audience as everyone played music from Stravinsky's The Rite of Spring (Part I). 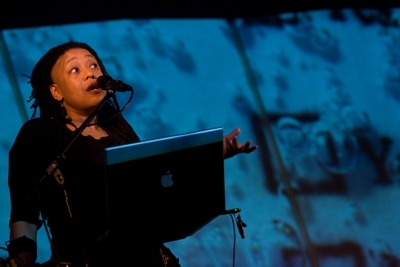 New Music New College wrapped up its 10th season with a fabulous multimedia performance by composer and vocalist Pamela Z. Using a technique know as "looping," Z built songs layer by layer as the audience watched, until dense, rhythmic creations swirled around, made of nothing but her voice. 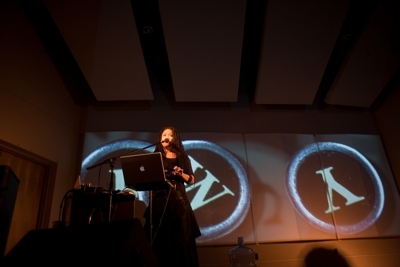 Z also incorporated video projection into many pieces, with visuals filling the back wall and even the ceiling panels of the auditorium as she performed. Some of the images and sounds were triggered by MIDI sensors on her body, as she used gestures to "type" (and a typewriter sound would play) in Typewriter or ring the bell of an imaginary San Francisco cable car, in her song The Muni Section. In the concert Z performed more than twelve of her pieces, including Bone Music, Pop Titles "You", Broom, and a Suite from her evening-length work Voci.